It is desperate times at Samoa Airways as its only aircraft leased from Italy had to be returned Monday leaving the national carrier with no aircraft and forcing it to reissue travellers’ tickets on competing airlines. The minister in charge of the airline, Lautafi Selafi Purcell told Talamua that they are speeding up negotiations so that when the replacement aircraft from Malaysia arrives Thursday this week, it will be able to fly to New Zealand. “The contract with the Italian company that the Samoa Airways leased the Max 8 aircraft ended and it flew back to Italy as we could not continue our lease,” said Mr Purcell. He said they tried to extend the lease until the replacement aircraft from Malaysia arrives this Thursday, but the Italian company demanded the use of the aircraft after all other company aircraft were grounded following the incident in Ethiopia. With the aircraft gone, Mr Purcell said the government is working to find a solution so Samoa Airways travel would not be disrupted further. The Malaysian aircraft Malindo to be leased by Samoa Airways for six months is awaiting confirmation from New Zealand for it to be able to land there. Mr Purcell told Talamua that Samoa is speeding up negotiations that normally take 3 months. “We have asked New Zealand to assist with our request. With Australia there is no problem as Malindo flies to Australia, but not New Zealand hence the negotiations,” said Mr Purcell. He said one of the options was to charter a flight to accommodate travellers who have already booked with Samoa Airways. “We try to reduce the disruption from the time Samoa Airways left and tomorrow we are looking at ways to accommodate people who have already booked their travel with either Air New Zealand or the Virgin Blue,” said Mr Purcell. He could not disclose the cost Malindo has been leased for but said he has been given assurance that all will go well once the aircraft is on land. 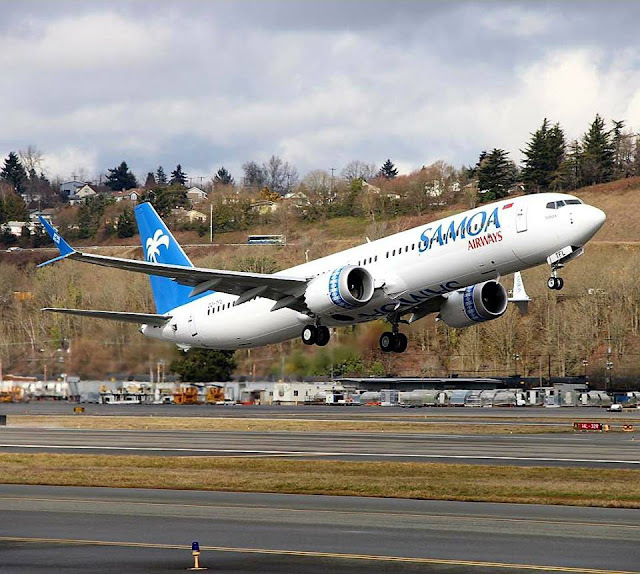 Samoa is supposed to get another aircraft in August from Fiji, however, that plan is also on hold due to the grounding of the Max 9 aircrafts. Mr Purcell said Fiji has confirmed that they need the aircraft since the grounding of some of their Max 9 aircrafts. “No one predicted these things to happen, and for some countries, all 50 aircrafts have been grounded, now imagine the dilemma faced by travellers all over the world,” he said. Mr Purcell is not sure when these aircrafts will be allowed to fly again but hopes the investigations will provide a solution much safer for the travellers. “This is the reality of aviation and whatever happens, safety is given priority. With the absence of Samoa Airways, Mr Purcell believes this will have an impact on air fares between Samoa, New Zealand and Australia. “Fares are expected to go up again because of the traveling demands but also because they have the upper hand on the market now,” the Minister said.